USING A PORTOLAN CHART AT SEA; DID THEY? ARE THEY PRACTICAL OR IMPRACTICAL FOR USE BY MARINERS? Within the pages of “Les Cartes Portolanes2” and on the included DVD, are exhibited most extant charts for study purposes as the book intends. But, these charts include minor quirks of presentation and thus to fully explain and simplify the usage in this text, a Mercator Projection Map of the Mediterranean basin and Black Sea area has been used to represent the ‘Map within the Portolan Chart’. They are after all akin, being flat earth maps with a basic rectangular graticule. The extant Portolan charts also exhibit a variety of magnetic declinations varying c8 to c11 degrees and therefore for this research only one has been used, 11.25 degrees, one quarter wind, as it is the average from 1300 to 1500AD. It also fairly represents Genoa, the origin of the first extant Portolan Charts3. The declinations in 1300 varied from c5E at the Pillars of Hercules to c15E at the Greek Peloponnese and across the Black Sea area. By 1500 it had declined to c7E at the Pillars and at the Peloponnese with a maximum declination of c10E in the Gulf of Sirte as the appendix diagram ChUgD11 illustrates. 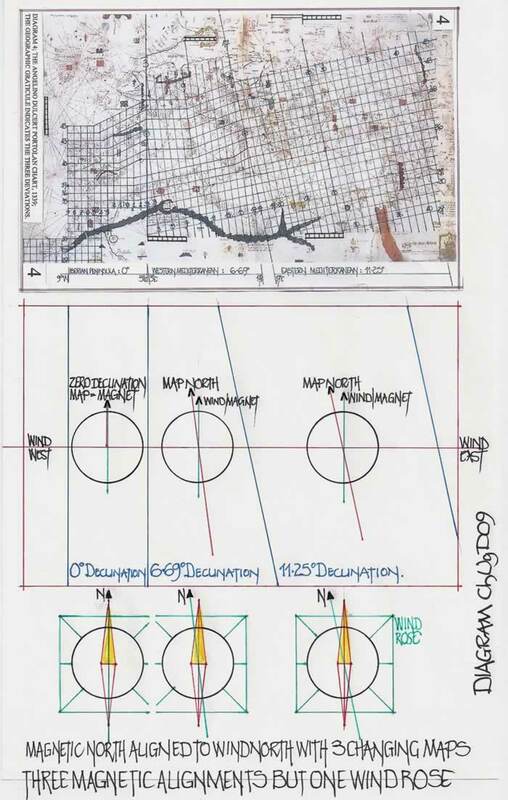 With the parameters for the research set, the actual charts, their wind rose and magnetic declination can be assessed and the possible method of utilisation established. If there are a number of differences that can be attributed to the route of a ship by the use of either the wind system and/or the magnetic compass, then it is a major problem to assess which should be a plus or which should be a minus to the overall summation of the route. Thus it is perhaps prudent to consider the consequences of using subjective differences. If the actual accuracy of the magnetic compass is unknown, i.e., accuracy is derived from the size of the (floating) pointer and the actual subdivision of the perimeter of the receptacle (if in fact it was done and is not just guess work for an angular course), then the deviation of the needle by virtue of the Earth’s magnetic field, and, finally the accuracy of the chart used for the route chosen will determine the overall accuracy, if any exists. Each of the above could be a positive addition or a negative reduction in the route calculation and therefore the prudent methodology assessing the possible sailing route directions used would be to accept the basic chart with all its vagaries and the basic wind and or magnetic directions without subjective alterations. Thus a wind route read directly from the Wind Rose would be accepted as correct and able to be kept by the mariner whose expertise could overcome the shifts and course changes, and, a magnetic compass route would produce a curved course by virtue of the Earth’s magnetic changes. That is accepting the premise mariner’s did not know or understand declination. (This I must challenge later). During most sailing days in the Mediterranean Sea there is sufficient light to produce shadows. Thus by virtue of a single gnomon (a mast) and the shadow cast, not only can midday be established but also therefore Due North (geographic) and thus the points of the compass. The accuracy of the sun shadow if recorded correctly is a permanent daily check upon the route. But, what accuracy level is required for Midday: what deviation would 5 minutes create, or even a 15 minute error. They would produce either 1.25 or 3.75 degrees error. But if the chart does not have enough accuracy to start with then this will produce a larger positive or negative change to the route direction as already discussed. Can we therefore equate scientific readings to the early magnetic compass, the midday gnomon or the Portolan chart: obviously not. We must accept that vagaries exist and that the mariners who had sailed these waters for aeons were quite adept at correcting their course as necessary. It is perfectly feasible to find latitude in the northern hemisphere using the altitude of the Pole Star, as the North Celestial Pole is an extension of the Earth’s Geographic North Pole into the sky. It has a fixed declination; that is the angular distance from the celestial equator, by definition set at +90 degrees. However altitude, the angular position of the Pole Star to the horizon varies according to your latitude. Thus by measuring the Pole Star angle to the horizon it is possible not only to know your latitude, it is the same as the angle, but obviously you can calculate your position from any other point of known latitude. We should bear in mind that tables of latitudes4 were being produced for this usage. However, yet again we meet the spectre of accuracy. At present, Polaris lies very close to the North Celestial Pole, being about ¾ degree from it, but that is actually irrelevant. Even when the pole star was slightly further away from the NCP, the fact that it spins around the NCP and thus aligns perfectly twice to the projected Geographical North Pole during the night means the Pole star is an accurate measure of true or geographical north. As the pole star rotates in its small circle an observer will note when it is at its highest point, and thus accurate; and when it is at its lowest point for the same accuracy. Thus the Pole Star is an eminently suitable marker for true or geographical north. Most astrolabes used for reading the angle of the Pole Star to the horizon are of small diameter and hence as with the magnetic compass, size determines accuracy. The western Mediterranean Sea has a latitude variation of c8 degrees, that is 600 mpm or 888 Km and a single degree deviation in the reading is thus commensurately an enormous problem being 75mpm or 111Km, the measurement of that degree. From the Gulf of Sirte to the Gulf of Venice is actually 14 degrees latitude. I have shown that the F Beccari5 Charts, supposedly altered to place Corsica and Sardinia correctly in the Mediterranean Sea are still more than a single degree adrift even after the supposed adjustment! At all times I have accepted that the place name position written on the “map within the Portolan” is correct. However it need not be, as although they are written in the correct order on a length of coastline and may of necessity be squeezed into a short coastal length, their relative positions may be awry. Thus on different lengths of coast there is the distinct possibility of varying positional accuracy. Thus my research uses the information as given and does not attempt spurious changes to suit a mathematical or statistical alteration on the basis of perceived errors which cannot be quantified, or information thus derived that may be applied positively or negatively. Each chart drawn commenced with the Wind Rose (or two) graticule set out to a deliberate scale6 with ratio spacing for the graticule of 35-30-20-7 representing the alignments of the 22 ½° winds; the 16 important winds. 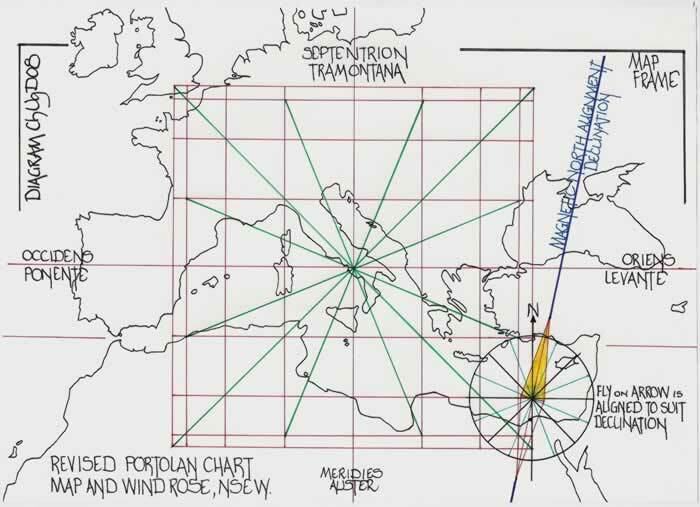 A map of the Mediterranean basin is then drawn upon the wind rose graticule with the putative centre line of 36N latitude pivoted to align from Quarta Ponente verso Libeccio to Quarta Levante verso Greco; that is 11.25° slewed southwest/northeast. The vertical centre line of a single wind rose is generally set around the centre of the Mediterranean Sea, 15/16°E longitude7. 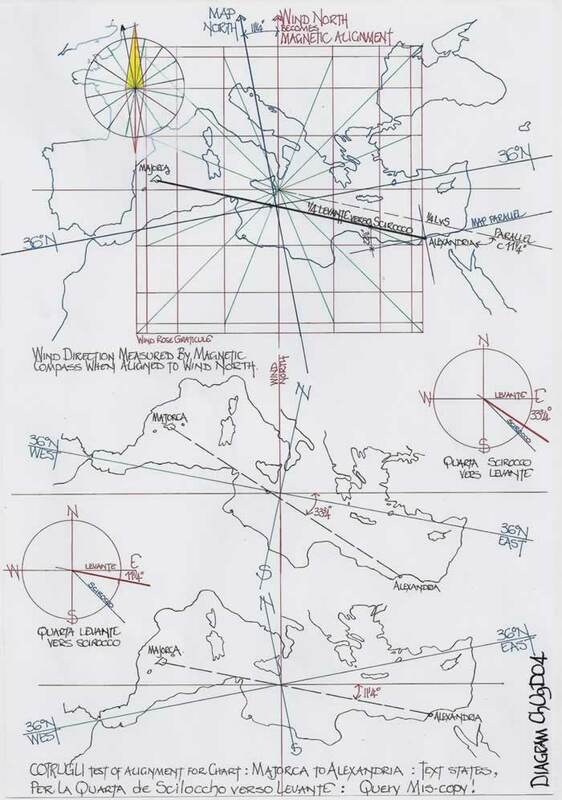 Although these charts are to be used for navigation via a magnetic compass, at this point there is no indication to the mariner of the magnetic deviation the map has been drawn at against the geographic north point, unless the mariner actually measures the 36°N latitude deviation to the wind rose NSEW and knows that it is the magnetic declination. This fact has been disputed by R J Pujades and J Alves Gaspar who state magnetic declination was not known by seamen. However, as the wind rose is always denoted geographical NSEW which is at odds with the ‘Map within the Portolan Chart’ any mariner should know by looking at the skew of the Mediterranean Sea centre line 36°N from the Pillars to the Gulf of Issus that there was a discrepancy. The 36°N alignment is an historical base for geography and maps over some 2000 years. Thus it was necessary for the mariner to align the magnetic compass to the Portolan chart to enable both to be utilised, the ‘geographic winds’ and the ‘magnetic winds’. The basic Portolan sans decoration is eminently suitable to be used for sailing directions via the magnetic compass, provided the variation in the declination along the Mediterranean Sea is ignored, but it cannot be, as is discussed later. Place a straight edge across the “map within the Portolan” aligned from your departure point to destination point and then slide the straight edge (if necessary) onto the Wind Rose and read off the indicated wind direction. It will not be a geographical but a “magnetic wind direction”. The example being used here-in is Majorca to Alexandria, which would be read off as “quarta Scirocco verso Levante” or “quarta Ponente verso Maestro” (i.e.11 ¼° one wind south of east, or EbyS). Use the magnetic compass with this wind direction noted upon a basic Fly aligned to the magnetic arrow and all else being equal the route for sailing is assured. But the one decision that cannot be made is to sail by the “geographical wind that is EbyS”, it will not work! The two systems therefore appear not to be interchangeable and thus not compatible. But if you use the Portolano Book then the wind would be noted as WNW/ESE, that is Maestro/Ponente out and Levante/Scirocco return, the quarter wind difference. For a long period after 1300AD, perhaps 50 years or more, there would have been many ships unequipped with a Portolan Chart or Magnetic compass, but only the Portolano Book, or the individual mariner’s notes. Thus there could be two ships leaving Majorca for Alexandria at the same time, one sailing by the Magnetic Compass and therefore sailing “quarta Ponente verso Maestro” to “quarta Scirocco verso Levante” and the second sailing via the Portolano Book using “Maestro/Ponente” and “Levante/ Scirocco” the geographic wind directions, and this last method would be capable of using the “Rule of Marteloio8” as an aid. The authors of the texts describing the use of the Marteloio use only the geographic winds and do not mention the magnetic winds, aka, declination, although the calculation would be the same. This dichotomy had to be resolved if the Medieval Mariner, as we are so forcefully informed had no understanding of magnetic declination. Therefore, was there a method to ensure both systems could be used from the same chart, or are the two systems not at all interchangeable? 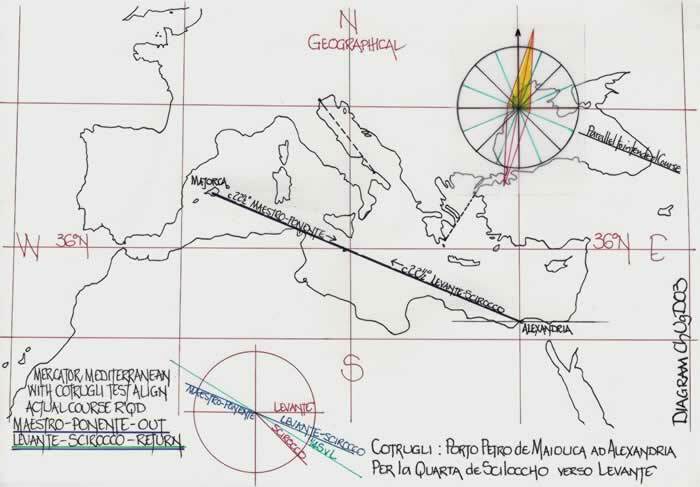 The Cotrugli text which is analysed later indicates a complete lack of knowledge to resolve this dichotomy, as the author does not realise the method stated to check if a chart is correct is actually using a magnetic bearing named as a wind when he suggests using the Majorca to Alexandria route as an accuracy test for a chart. But before moving to the possible utilisation of the Portolan Chart by both of our Mariners leaving Majorca for Alexandria it is necessary to discuss the actuality of their sailing routes. Firstly, the Mariner who sails by the Portolano Book geographic wind, WNW/ESE, before he departs Majorca will have noted via the sun shadow at midday the direction of North/South and thus been able to align the Ship’s Bow to the WNW/ESE route and by reading the sun path movements keep to that direction, which is of course confirmed as night falls by the Pole Star generally taking the position of the sun shadow at noon and the angle of the bow is thus checked and the course confirmed. Sailing as was known for aeons. All else being equal this mariner will arrive safely in Alexandria having sailed by a geographical and therefore fixed methodology. The second ship sailing by magnetic compass direction has merely taken the straight line reading of the route, noted it on the magnetic compass Fly as WbyN and EbyS, and simply ensured the compass direction and the Ship’s Bow are always correctly aligned. But, as both R J Pujades and J Alves Gaspar adamantly state, the mariner did not know about magnetic declination. Thus the magnetic course only holds true when the actual declination across the whole Mediterranean Sea from Majorca to Alexandria is our putative 11 ¼°, one quarter wind. But of course it is not and as soon as our two ships depart, ostensibly sailing the same course, the ship using the magnetic compass deviates away from the true geographical wind course ship. Basically around 1300 AD the declination for Majorca was c8° and for Alexandria c16°. Thus when the ship sails it is c3° off course immediately. That may sound a little, and has been noted as perhaps below the threshold of accuracy available, but align a chart with the two courses and the difference is marked. It matters not that the accuracy is unavailable as the deviation must be applied both plus and minus to any course which as I have stated tends to negate the inaccuracy being utilised. Therefore as it approaches the area south of Sardinia it is then in a correct declination reading area of c11 ¼°, but as soon as it passes Malta it is the same c3° off course again and gradually this increases to 5° off course as the ship approaches Alexandria. From Majorca to Alexandria it is an aggregate of 8° discrepancy which will send any ship so far off course as to be unacceptable. This of course presupposes no corrections, (which is the fact we are told to accept), as it would be an unknown deviation and thus the readings are accepted as correct. Even the possibility of reading errors can alter the accuracy. Let us therefore consider what that actually means. If the mariner has no knowledge of the variations in declination, (a fact hard to believe, as all mariners would know where due north/south was by the masts shadow at midday, or a very close due north from the pole star), then he assumes the compass bearing is correct and continues to sail with the ship’s bow aligned to the course required by the magnetic compass direction, WbyN or EbyS. But, he will in fact be sailing a curved course as the declination changes from c8° to c11 ¼° to c16°. The final c5° shift off course is likely to land the ship far away from Alexandria. Is this the accepted situation for the mariner, would he not question the veracity of the magnetic compass which ostensibly gave him a direct course from Majorca to Alexandria, but led the ship quite severely astray off course and therefore no to the intended destination. Is this the reason the use of Portolan Charts and Magnetic Compasses are not mentioned in the extant texts, such that Professor P Falchetta and Professor P Gautier Dalche wrote as they have regarding their non usage, as I indicate later? But the original premise of this paper is to investigate how and why the charts are drawn with Geographic Wind Roses, deliberately annotated with the correct titles and corresponding wind names; how a mariner having a Portolan chart can sail by Geographic Winds which after all are the descriptive routes in the Portolano Books; and how two mariners can sail from Majorca to Alexandria with one saying he is using the WSW/ESE winds and the other the WbyN and EbyS winds? THE BASIC STEPS REQUIRED IN USING A PORTOLAN CHART WITH THE GEOGRAPHICAL WINDS, AND A MAGNETIC COMPASS. If the compass is set upon the chart the discrepancy between the Wind North and Magnetic North is immediately apparent. To align them both the following actions are necessary as the magnetic compass no matter how it is twisted will always point to the same direction visually. Hence the first problem with using the Portolan chart as drawn occurs; to enable the compass to be used for wind directional sailing the magnetic alignment inherent in the drawn chart, the slewing of the map must be corrected. This must be done on a flat surface in the cabin or cockpit so that the alignments can be seen and marked out. Firstly the magnetic compass must be set upon the wind rose with its centre point upon one of the wind rose north/south lines so that the deviation of the compass arrow can be seen from that north/south line. Then the prepared FLY, (which in all probability is no more than a miniature wind rose with 16 points drawn there-on), can be set upon the magnetic arrow with its north /south line aligned to the wind rose north/south line. 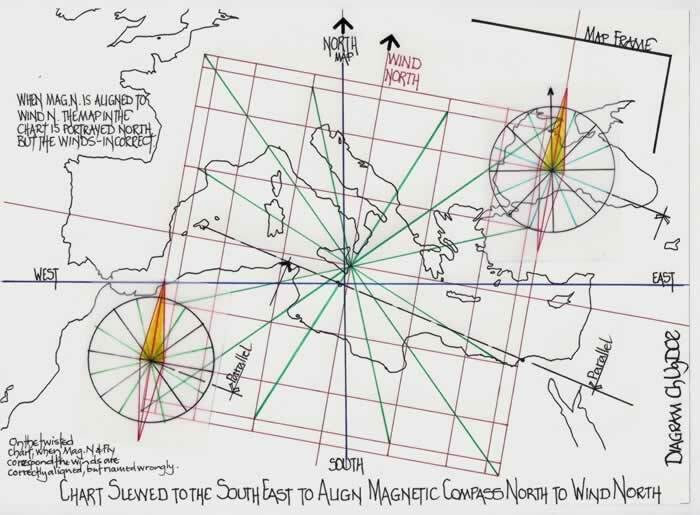 Thus there is a correlation between the magnetic north and geographical north for the magnetic compass to be used on the chart for ‘Geographical Winds’. This however is fraught with difficulty and depends entirely on the compass manufacture. If it is a closed box it requires being such that the arrow’s direction can be easily gauged and for alignment a straight edge would be placed across the box to align the chart wind rose such that it can be moved and the FLY attached in the correct direction. If a Magnetic compass is supplied with a pre-fixed Fly, at least any discrepancy can be seen by this method to the charts basic directions. But if it is successfully achieved the ‘Map within the Portolan Chart’ will be capable of being accurately used with the actual compass arrow to provide bearings for directional sailing no matter what the declination actually is (but it must be accepted the discrepancy of declination will occur) and the Fly can be used for sailing by Geographical Winds when it is adjusted to suit the ships position. To use the Portolan Chart as a Wind Chart via the magnetic compass with a Fly attached (as above), yet again a flat surface must be available as the first task is to align the Compass Arrow North with the Wind Rose North such that the FLY will then accord with the Wind North. As stated, the magnetic compass will always read only one alignment, magnetic north/south; twist it as much as you wish, it is the same direction. 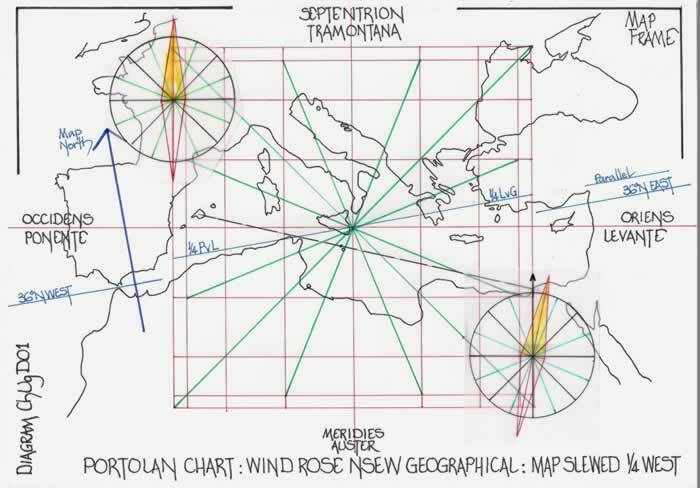 Thus the only method of aligning the magnetic compass to the Wind Rose north/south line is to twist the actual chart until there is agreement between the two. Place the compass upon the chart with its centre over the Wind Rose north/south line and gradually twist the whole chart on the flat surface in a clockwise direction until the magnetic arrow is in alignment with the Wind Rose north/south line. This places the FLY alignment in agreement with the map north (although of course it is never drawn as a line), as shown in the upper example and any bearing required can now be read off by aligning a straight edge across the map and transferring it to the compass Fly. Thus directional sailing is now available via the magnetic compass for the actual winds and it must be left atop the chart in the precise position if course alterations are required. This of course in a choppy sea may prove impossible and this action of alignment may be required several times during a voyage, not least for changes in course direction. But what has been achieved is only relevant to the compass directional sailing for Geographical Winds. By twisting the charts Wind Rose to match magnetic north, in our exercise 11 ¼° or one quarter wind awry, then the Wind Rose is automatically that number of degrees and that wind quarter adrift from actuality. One way or another one North Point will be 11 ¼° or one quarter wind adrift. The Wind Rose is always drawn NSEW, but is now as askew as the original map was. 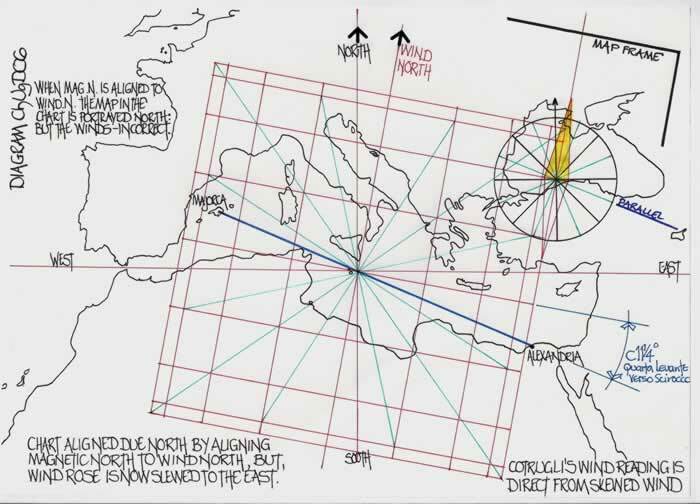 If you are sailing from Majorca to Alexandria the Fly atop the magnetic arrow will indicate a bearing of 22 ½°, but if that alignment is transferred directly to the Wind Rose, as it is now situated, it is 11.25° askew changing the wind from Maestro-Ponente (Levante-Scirocco) to Quarta Ponente verso Maestro (Quarta Scirocco vers Levante). This would surely be an untenable situation for a mariner, having to continually re-align the chart for ‘magnetic sailing directions’ and ‘geographical wind direction’. There is of course the option that the mariner reading off a course of 22 ½° from the Fly atop the magnetic arrow would know the name immediately of the actual wind without recourse to using the wind rose on the chart, but how did the mariner accept that there was such a dichotomy in the winds direction, and how would the “Tavola de Navigatione” and the “Rule of Marteloio” then be used. 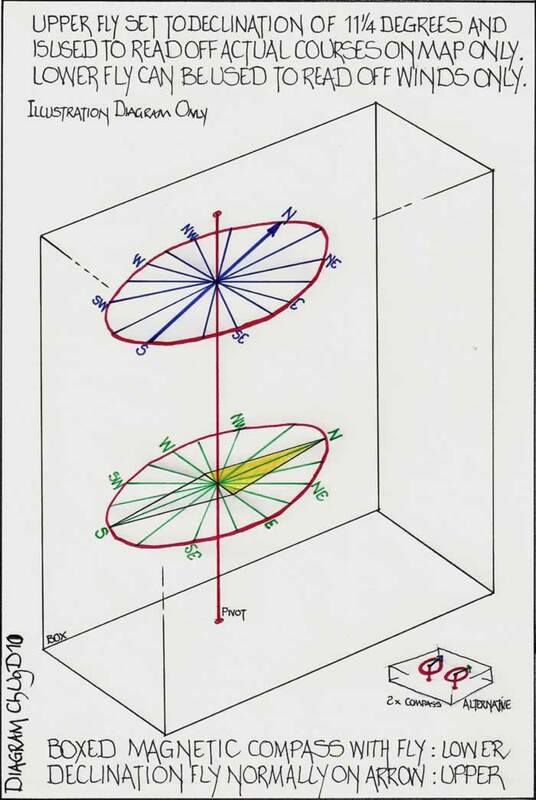 Therefore, what if any function does the Wind Rose serve on a Portolan chart as it cannot give the correct reading set against the magnetic sailing direction? Did it require to? It is obvious that such variety of figurative models, in which reliability and precision could not be verified by their authors, represented an obstacle to the use of cartography as a practical instrument essential to navigation. I believe that this condition of uncertainty was evident to medieval men, and also that they had very clear awareness of the difficulty of establishing a definite “technical” relation between geographical space and maps. we find an explicit reference to this problem in Benedetto Cotrugli’s treatise ‘De navigatione’, an important fifteenth-century work that we will examine below, Cotrugli, a wealthy merchant and ship owner from Ragusa (today’s Dubrovnik) who had acquired considerable navigational experience on board Genoese, Venetian and Catalan ships, provides some instructions for testing the precision and exactitude of cartographical drawing on the carte da navigare (Portolan charts), He states that it is possible to know whether a Portolan is right (giusta) simply by tracing one line from Mallorca to Alexandria, another line from Venice to Monopoli, and another line from Tenedos to Cape Maleas. If these lines do not cross any islands (scapulando li scogli et le isole), the map is right, otherwise it is wrong. This is of course a very empirical and rough method, but it is also a very useful way for reckoning the accuracy of a map at first sight. However, Cotrugli warns his readers that although very commonly used by sailors, such method sometimes worked and sometimes didn’t: fala questa regola, he writes. The acknowledgement that this system is fairly unreliable is essential because it makes clear that medieval men’s attitude towards maps was very different from our approach to modern maps. Actually, the doubtful nature of medieval cartography is a direct consequence of uncertainty about geographical space, its shape and extension. Nevertheless, Cotrugli describes the use of Portolan charts in detail. This description is without precedent in other texts of previous centuries – I’ll discuss later the reasons of this strange uniqueness (particularity) – and this makes it a document of extraordinary importance. Cotrugli writes that directions (venti), distances (migla), and place names (nome delli lochi) are marked (e signa) on Portolan charts. Directions are necessary to compare information given by the compass during navigation with the actual route of the ship. A route is not a straight line, but the result of a series of boards, and only sailors experience could determine the difference between the true (intended) course and the course made good (actual course sailed). Then, he continues, there are distances that depend on the speed of the ship and on the current. In order to appraise the distance covered in one day by one ship, it is therefore necessary to turn over the sand-glass (mezarole) night and day, and mark each time with a spot of wax. This is the method for calculating how many miles the ship travelled in an hour, and in which direction. At that moment, it becomes possible to establish the point where a ship is located. Once you have established that point, it is possible to calculate your route using dividers, and to know the distance of your ship from the coast. A question is raised here: why is Cotrugli’s text the only pre-modern text – as far as I know – that contains such a detailed description of the use of Portolan charts in Navigation? If charts were commonly used by sailors, why are there not references to this practice in other contemporary nautical texts? (end quote). Firstly it is necessary to reiterate that from Majorca to Alexandria is a 22 ½° South of East course and hence the wind is, outward ESE Maestro-Ponente and return WNW, Levante-Sirocco. This of course indicates a quarter wind, 11 ¼° difference to that quoted by Cotrugli as already indicated. But, the use of the SE by E or Quarta Sciricco verso Levante must be a mistaken or rather mis-copied wind direction. Given the setting out of the “Map within the Portolan” it is likely to be East by South, Quarta Levante verso Scirocco, merely a transposition of the wind names. Diagram ChUgD04 is the setting out of both winds and the problems for the maps orientation if the Cotrugli text was proven to be correct. The diagram also illustrates that the quarta Levante verso Scirocco is a direct reading from the Wind Rose which is skewed, as already explained, and has not been corrected for that fact. Inadvertently Cotrugli has quoted the Magnetic Compass Direction (as corrected here-in), which he has treated as the wind name direction to denote it. Upon Diagram ChUgD05 which is a geographic map NSEW, the sailing route is shown as Maestro-Ponente or Levante-Scirocco. If the two alternate sailing directions are added to the map it can be seen that from Majorca the ship would land in either Sicily or on the North African Coast and from Alexandria it would sail to the Toe of Italy or into the North African coast near Tobruk. Thus by not adjusting for declination Cotrugli has indicated the wrong wind to test his alignment theory, and indicates he actually did not understand the usage of the Portolan Chart with a magnetic compass, because as already stated his (corrected) “quarta Levante verso Scirocco” is in fact the magnetic compass direction. Here it is pertinent to add that Cotrugli added a “get out” clause, but it is up to researchers to make their own judgement upon his text and his magnetic knowledge. 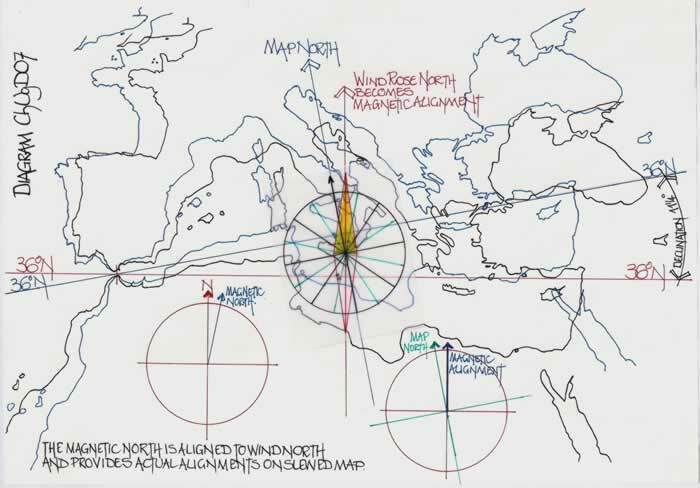 Included as Diagram ChUgD06 is the simple explanation of Cotrugli’s wind direction from Majorca to Alexandria, which is as stated a direct reading from the Wind Rose plot unadjusted for the slew. The slewing of the map anticlockwise within the Portolan Chart is totally unnecessary as can be readily illustrated. The magnetic compass reads as if north is 11 ¼° east of Wind Rose or Geographical North. Thus if the ‘Map within the Portolan’ was drawn precisely Geographic (Diagram ChUgD08) and accorded therefore with the Wind Rose all that was necessary to enable the mariner to use the magnetic compass was a simple line drawn at 11 ¼° East of North to which the magnetic arrow was aligned and then the Fly atop the arrow is set to Wind Rose and Map North. Then there would be no discrepancies in reading either the sailing directions or the actual winds to be used for sailing the route required. Professor Falchetta has expressed his concerns regarding medieval men’s attitude towards maps being very different from our approach to modern maps. That excludes the obvious observation that any mariner with the smallest degree of geographical knowledge could find Due North, therefore knew of the disagreement between that of the magnet and Wind Rose North which is also Due North. The mariner had been sailing by Due North and the winds for aeons and at first possibly could not reconcile the difference between Due North and the Magnet, but the Portolan Chart attempts to do just that. However it fails spectacularly as it then negates the Wind Rose which is both the progenitor and arbiter of the whole system. Are we to accept that nobody understood the difference between the two and they were only used for ‘Maps in Portolan Charts’ which are “library Editions”? Both RJ Pujades and J Alves Gaspar10 state quite plainly that they considered medieval mariners were unaware of the magnetic declination, even though the evidence of their knowledge was so apparent. That can be easily ascertained by actual Portolan Charts. 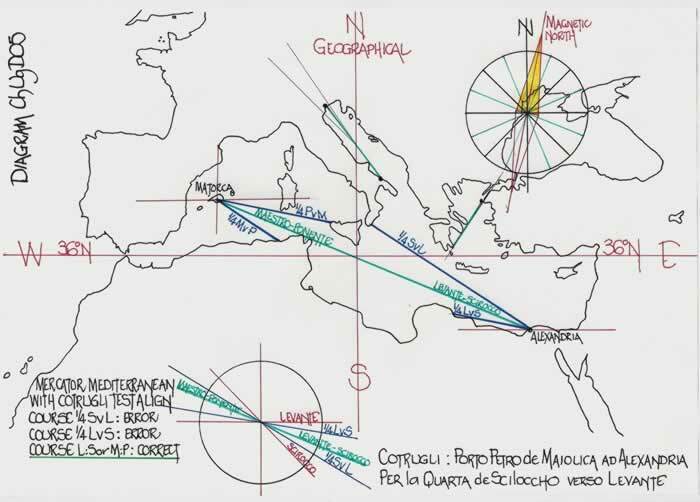 Following the re-evaluation of charts by R J Pujades (Carta Pisana text) both Vesconte and Dulcert may be considered the earliest cartographers. My text ChCs/1 actually indicates that the Riccardiana ms3827 chart is probably the oldest from which all others are probably copied. I add here a cautionary note regarding the date for the Carta Pisana11. Pujades took just 9 pages to explain why it is perhaps not as dated; but, Campbell took 117 pages to respond that he thought it was the oldest. It is not impressive, but verbose. But one chart by Angelino Dulcert, his 1339 chart held by ‘BnF Paris’, ref B696 and illustrated in LCP pages 120/121 as C8, is of particular interest apropos the practical or impractical use of such charts by mariners. The chart, as shown in Diagram ChUgD09, has three distinct declinations. They commence with the Iberian Peninsula set to the Agonic Zero declination line; then in the western Mediterranean Sea area defined to the Foot of Italy the declination is c6.69 degrees; then in the eastern Mediterranean Sea, including the Black sea area the declination is c11 ¼°, or one quarter wind variation. The wind rose is set NSEW and is for all declinations and thus Dulcert has not drawn his chart to any actual declination reading which may have been possible at that time. His chart indicates no knowledge of real declination but of the actuality of readings that may have been taken anywhere. Thus by studying the c1300 magnetic deviation chart shown in the appendix, it will be seen that the deviation from west to east is from 0° to 15° east of north, and we must assume that Angelino Dulcert was fully aware of this phenomenon and structured his Portolan chart to suit. But, how can it be used by a mariner, unless the mariner is aware of the three deviations to adjust the Fly atop the magnetic arrow accordingly. The plain answer is the mariner could not, he could only align it to either west or east via the wind rose north line and hence there was an 11 ¼° error when the magnetic compass was used at opposite ends of the chart. The average error in the centre is still enough to misguide the mariner considerably. Did the Mariner just ignore it all? Do we accept that they were so lacking in knowledge that this chart, even in a basic form, was acceptable? I think not. The usage of this and the other charts at sea is therefore very doubtful as the contortions required to constantly align and realign the charts to accord with the geographical winds would have been a major problem and the accuracy of the magnetic compass is unknown. Firstly, had the designer cartographer of the premier Portolan Chart not tried to align the magnetic compass arrow to the wind rose north by pivoting the ‘map within the Portolan’ by the same amount thus merely maintaining the relationship between the map and the magnetic compass the problems of the wind rose north would not have occurred. It was unnecessary and thus although it has produced a visually attractive chart, it would have served mariners better by an aligned map and wind rose, with a fly adjusted to suit. Previous researchers, by constantly drawing diagrams in their papers precisely as a Portolan Chart is presented, and then applying a “symbolic” magnetic compass to the Portolan Chart, have through their methodology not determined the actual actions necessary to align the magnetic compass for the geographical winds which has led to a fundamental error and misunderstanding. It is impossible to align a magnetic compass to a Portolan Chart; the chart must be aligned by twisting or skewing clockwise to meet the magnetic alignment. Had this been done then it would have automatically shown previous researchers that the Wind Rose was no longer geographically oriented and could not be used with a magnetic compass Fly north set for the map north, but had to be used with the magnetic compass arrow. That would require a separate Fly aligned to the magnetic arrow to read off the wind direction as Diagram ChUgD10 illustrates. This is too complicated a set up for a mariner to use at sea and the Portolan Charts must therefore be consigned to the “Library” as beautiful works of art, not navigation tools. Navigation is fully explained in the texts of Ramon Lull, Michael of Rhodes, Andreas Biancho and A.N.Other, they refer always to geographical winds, do not mention a compass or using a compass to establish direction. Thus it is probable these charts were not actually used for navigation as has been surmised previously. “To conclude, I would say that nautical treatises of the Middle Ages do not describe the use of Portolan charts in navigation at all because the whole matter was entirely determined by the practice of navigation. In other words, Portolan charts could be wrong in so many details that it was almost impossible to prescribe rules for their actual use before knowing the level of their relative exactness. Cotrugli, on the contrary, as a learned man accustomed to abstract concepts, was not interested in the practical use of Portolan charts. His treatise subsumed theoretical and practical knowledge within the same effort to render a general description of navigation. Thus we can perceive that the charts perhaps not being used at sea for navigation purposes, but probably “library” charts need not be 100% accurate in the toponyms! 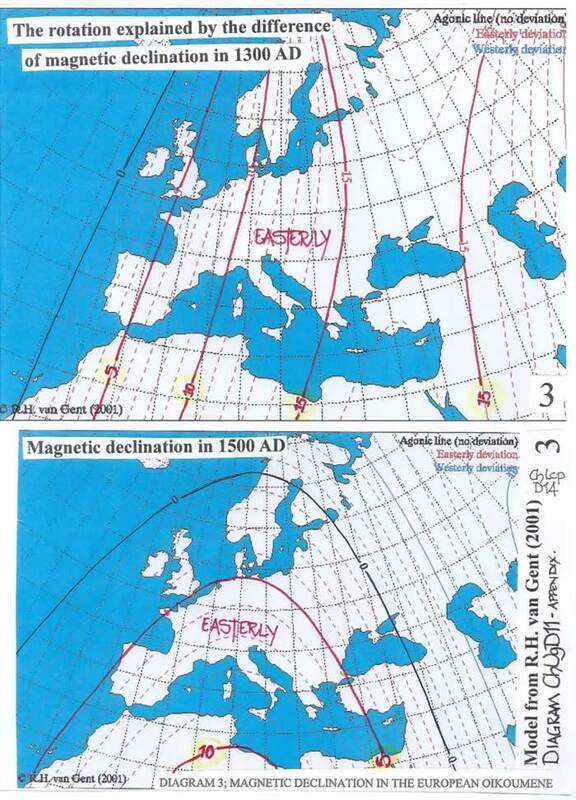 Magnetic deviation charts for 1300 and 1500AD. Note that the declination is always positive and that indicates the declination is always to the East. Gradually it changes but not in the period of the Portolan Charts construction. NOTE; this text does not deal with the small charts, A3 and A4 size which I consider are no more than visual copies of the Portolano Book Texts with a magnetic bent, which on so small a chart was probably inconsequential. The mariners probably knew by rote the geographical winds and their directions. 1 Parry ,J H ”The Age of Reconnaissance”, Weidenfield and Nicolson, London, 1964, pp 101/102. 4 Wright JK, 1923, Notes on the Knowledge of Latitudes and Longitudes in the Middle Ages. Isis 5/1, pp75/98. See also the Alfonsine Tables dated 1252 for computing the position of the Sun, Moon and Planets etc. 11 Ferrar MJ, text ChCp/0, the Carta Pisana:Date Unknown, on the Academia.edu website.